I've been trying to work primarily on paintings I've put away unfinished but most of them are in my favorite (Not111) medium of acrylics! I probably should just paint over them in oil but I hate to let things get the best of me. Following is the largest painting I've done to date in any medium. It's 18 x 24 and I was experimenting with texture medium. Love that stuff but will use it under oils in the future! 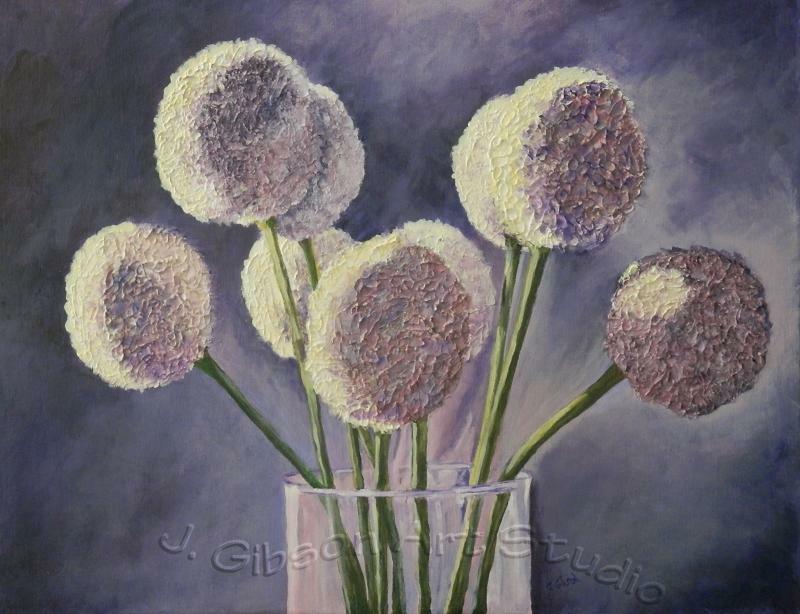 These are Allium flowers and I was inspired by the light as well as the texture. Funny how a large canvas is so intimidating, but I think that the large size helps paintings look better. Love your Alliums. Before we built our house, I had a very small area to paint in & just learned to paint small. I do think it's easier to paint larger though, and like you said, larger paintings tend to look better. Hopefully I'll do more but just not in acrylic!!! The texture is actually an acrylic medium which sets up white and is almost impossible to remove once applied. You can either mix acrylic paint with it before applying or paint over it with almost any kind of paint after it's dried. Love the texture and lighting. Does this get hung up someplace in your home now that it is finished? Thanks, Judy. Not sure what I'll do with it once it's "marinated" for a while and I'm really sure it's finished. It will probably get varnished and go to the gallery who handles my paintings. My husband is our "decorator" and he decides what paintings get hung in our home and he's not sure what he thinks of this one. Jan, I like the refraction in the glass, very interesting. I would like to attempt something like that some day. I am sure you'll enjoy working bigger, but it seems to take some adjustment. I was surprised when I started to paint larger at how much bigger my 'puddles' of paint needed to be! Odd that you should mention the glass, Alan. I practically ignored it as I'd waited until near the end to work on it and by the time I got to it, I was fed up with the piece and didn't do much to it. I'm working on a 16 x 20" painting now and yes, it definitely does take more paint - I still misjudge just how much and tend to put out more than I need though. Jan- What has been your experience with Acrylics… Do you like the fast drying speed? Acrylics is probably the only paint medium I really, really dislike. Someone once told me to add a lubricating gel to the acrylics and they blend easier. I've never tried it, but it is a thought. I have tried every blending gel, floating medium, slo-dri formula out there and acrylics still dry way too fast for me. I even got some of the Golden Open Acrylics and while they do dry a lot slower, they're so transparent that you have to paint something over and over again. Anyway, I haven't found a way to really enjoy painting with them although I do use them from time to time.